Daughter Becky had her family packed up and ready to go home after being with us for the weekend. 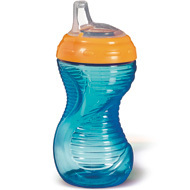 Nathaniel's sippy cup was missing. She had another, but this one was his favorite. We searched all over the house and the porch. After all, a three-year-old covers a lot of territory. "It's okay, Mom," she finally said in resignation. "You'll probably find it in some oddball place sooner or later." She was right. Ed found it this morning hiding behind a chair near the TV. We laughed. The last time they were here he left his favorite stuffed tiger kitty. It had been packed in his backpack, but at the last minute he took it out. He's getting a rep for the things he leaves behind. And in the end, he lives just fine without those things. Left everything. I need to examine my life and see what I should leave behind. What are my sippy cups and tiger kitties? What are yours?